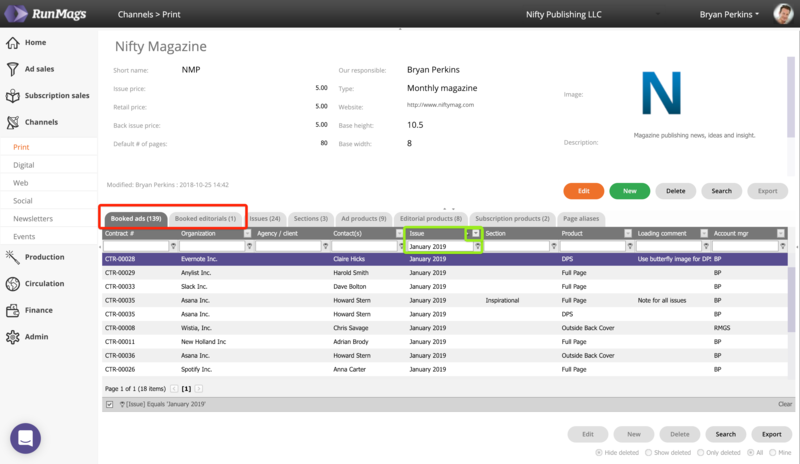 Go into a specific print channel and display your contractual commitments for advertising and editorials. Then in the first couple of tabs on the left (red box) you can find any booking for your selected magazine. The booked advertising and the booked editorials are displayed under two separate tabs. Use the filters to select to display only specific commitments. In the example above we have selected to display advertising sold in the January 2019 issue, i.e. the "run sheet" for that issue. By default, no filters are applied so that will display your indefinite booked advertising unless you apply a filter. Use the export button if you need to export a file containing more columns that what's displayed in the window.